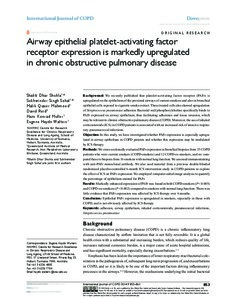 Background: We recently published that platelet-activating factor receptor (PAFr) is upregulated on the epithelium of the proximal airways of current smokers and also in bronchial epithelial cells exposed to cigarette smoke extract. These treated cells also showed upregulation of Streptococcus pneumoniae adhesion. Bacterial wall phosphorylcholine specifically binds to PAFr expressed on airway epithelium, thus facilitating adherence and tissue invasion, which may be relevant to chronic obstructive pulmonary disease (COPD). Moreover, the use of inhaled corticosteroids (ICS) in COPD patients is associated with an increased risk of invasive respiratory pneumococcal infections. Objective: In this study, we have investigated whether PAFr expression is especially upregulated in airway epithelium in COPD patients and whether this expression may be modulated by ICS therapy. Methods: We cross-sectionally evaluated PAFr expression in bronchial biopsies from 15 COPD patients who were current smokers (COPD-smokers) and 12 COPD-ex-smokers, and we compared these to biopsies from 16 smokers with normal lung function. We assessed immunostaining with anti-PAFr monoclonal antibody. We also used material from a previous double-blinded randomized placebo-controlled 6-month ICS intervention study in COPD patients to explore the effect of ICS on PAFr expression. We employed computer-aided image analysis to quantify the percentage of epithelium stained for PAFr. Results: Markedly enhanced expression of PAFr was found in both COPD-smokers (P�< 0.005) and COPD-ex-smokers (P�<�0.002) compared to smokers with normal lung function. There was little evidence that PAFr expression was affected by ICS therapy over 6 months. Conclusion: Epithelial PAFr expression is upregulated in smokers, especially in those with COPD, and is not obviously affected by ICS therapy.